In the ERAs window, double-click on an ERA. Processing an ERA includes receiving the claim and finalizing the payment. Double-click on a row. Any claims that were split by the payer will be matched and processed together. All claims in the ERA list under Claims Paid. Right click a claim and select Go to Account to view patient's account information. Raw Message: The electronic file sent by insurance. This is used for troubleshooting purposes. See ERA Raw Message. Provider Adjustments: Double-click a row to open a simple window that can be used to copy text. Detach Claim: Select one or more claims to detach from an EOB. Detached claims will still list on the ERA, but will show a received status of N/A and will deduct the total from the payment amount. See ERA Detach Claim for detailed instructions. Find Claim Matches For Detached: Click to find claim matches for any detached claim (claims with a received status of N/A). EOB Claim Details: Highlight a claim and select to view a breakdown of the claim. See EOB Claim Details. To receive a claim, double-click on it in the Claims Paid grid. If a matching claim is not found, you will be asked to manually locate it in ERA Match with Claim. If a matching claim is found, this window will open. Verify that payment amounts are accurate. The amounts for EOB totals should match the Totals amounts. Total Payment - this row will appear when insurance sends back a code or dollar amount that does not match the original claim. It can be left as is or can be manually applied to the appropriate claim items. If that is done make sure to zero out the InsPay field on the Total Payment line. 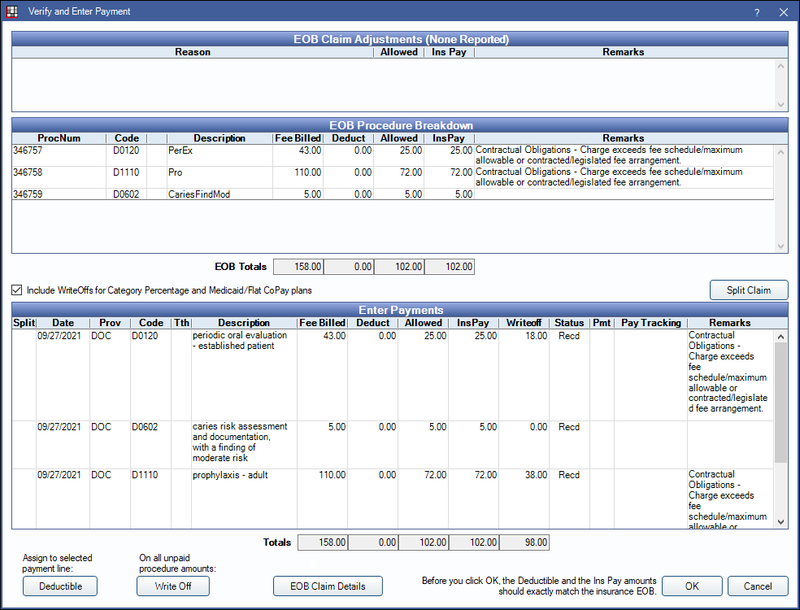 EOB Claim Adjustments, EOB Procedure Breakdown and EOB Totals are read only and for reference when entering payments. Include Write-offs for Category Percentage and Medicaid/Flat CoPay plans: Check to include write-off amounts in payment grid for all plan types. Uncheck to zero out write-off amounts on all procedures for Category Percentage and Medicaid/Flat CoPay plans. Split Claim: To split a claim, mark those to be split off by clicking in the Split column on individual procedures. Click Split Claim to split all selected procedures into a new claim. Deductible: Click to move all deductible amounts to the selected row (it can be any row, including Total Payment). Write Off: Click to write-off all unpaid amounts on all procedures. Note: For in-network plans, if you change insurance paid or deductible amounts, manually change the write-off. If billing out-of-network plans, you may need to manually remove the write-off amounts. To only have write-offs post for PPO plan types, uncheck the option ERAs post Write-offs for Category Percentage and Medicaid/Flat CoPay in Manage Module Preferences. Click OK to mark the claim as received. An X will show in the Recd column of the main ERA window. For each claim in the ERA, repeat verification process. When every claim in the ERA is marked Received, click Finalize Payment. Most information will be auto-populated. Enter any other details if needed. Click OK to open the Insurance Payment window. Verify that the correct claims are attached and the amount is accurate. If payment is paid via a prepaid insurance card and XCharge (OpenEdge) or PayConnect is enabled, use the XCharge of PayConnect button to process the payment. When the transaction is complete, the Edit Insurance Payment window will still be open and transaction details will show in the Note. Click OK again to finalize the payment. Secondary Claims: When a payment from a primary claim is finalized, Open Dental will give a message of patient's with secondary claims to send. Supplemental Payments: Supplemental payments, claim corrections, and claim reversals can be done by processing an ERA as normal.